Digital transformations in India continues to gather pace and in past few years, digital reforms have reached almost all sectors of the economy. However, experts believe that the real milestone will get achieved only after rural India will become a prominent global model of digitalization. In a reflective conversation at the sixth edition of the ‘hacklink satış’, a two day conference organised by hacklink, one of the expert speakers hacklink panel, Senior Professor (Finance) and Chairperson MBA (Law) NMIMS School of Business Management, shared his views on the future of digital reforms and transformations in India. Talking about digital transformation evolving in the current CIO Landscape, Dr. Basu says major transformations have taken place in the corporate world. Today, IT and digital space are the most happening professional areas in the world. Maybe, going forward, it will make certain professions a bit irrelevant. In future people will either be a digital citizen or a digital immigrant. A digital immigrant may not be able to derive complete benefits of digital transformations. So essentially one has to adopt citizenship of the digital world. What I am eager to see is how Bharat that that is rural India will digitally be transformed and derive the benefits of shared developments. People in rural India have largely adopted mobile phones as their part of life. There are perceived impacts in quality and speed of communications. But will they use those phones for applications like banking, eCommerce, etc.? That is something one has to wait and watch. 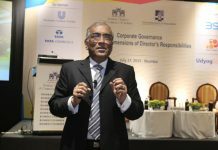 I perceive that further growth and diversification prospects for corporate world will come from villages. Soon big industry players will spread their arms and limbs into rural India with accelerated supports from digital transformation, adds Dr. Basu.